Today I and several others went out, clipboards in hand, to take petitions for the Save Lincolnshire Libraries campaign. David and Rowan Hall, Andy Austin and Laura Stephenson were in the market place during the day, and in the end we took around 239 signatures. Weather willing, we'll be out again on Saturday to do the same. The last time I went out petitioning was for the successful Save Louth Ambulance Station campaign. So there's no doubt in my mind that actions like these can have a good outcome. Going by the people I spoke to, the level of support for libraries is also very similar to that for the ambulance station. People are horrified by the county council's plans to reduce mobile library services and to close town branches. Many people were already aware of the proposed cuts, and a lot of people rushed to sign as soon as they realised I wasn't selling double glazing. The petition is a county-wide campaign. The actions of campaigners in Louth echo those of groups in towns such as Horncastle (360 signatures today), North Hykeham, Sutton on Sea, and more. It always surprises me how many people come to Louth's market from much further afield. 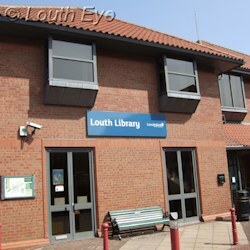 I spoke to people from other parts of Lincolnshire where, unlike in Louth, their library buildings are threatened with closure as well as their mobile services to nearby villages. Other people from outside the county told me about their concerns for libraries in their regions. Cuts to Lincolnshire's libraries are of national importance, because other county councils will be looking at this conflict and deciding whether or not the library budget is the soft target they thought it was. If you don't come across any petitioners with clipboards, there are paper petitions at The Wholefood Co-Op in Little Eastgate, at the kiosk in Spout Yard, and at KimmyBob Beads and Jewellery in the New Market Hall. There's also an online petition at Change.org. There's now an additional e-petition on the HM Government website, this time aimed at a national level, for the consideration of the Minister for Culture. This petition has more to do with the quality of the public consultation than the closures themselves.